The European Union and the United Nations today launched a joint initiative to eliminate all forms of violence against women and girls, one of the most widespread and devastating human rights violations across the globe. 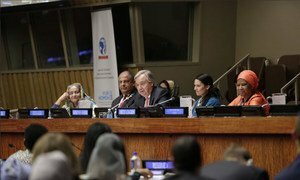 “It is a harsh but true reality – one in three women will face violence throughout their lifetime,” UN Secretary-General António Guterres said at the launch event, held on the margins of the General Assembly’s high-level annual debate. “Violence against women and girls devastates lives, and causes pain across generations,” he added. The EU-UN Spotlight Initiative is supported by a multi-stakeholder trust fund, with the EU as its main contributor in the order of half a billion Euro, which is open to other donors. “The European Union is committed to combatting all forms of violence against women and girls, as they undermine our core fundamental rights and values, such as dignity, access to justice and gender equality,” EU High Representative Federica Mogherini told the event. VIDEO: Spotlight Initiative to eliminate violence against women and girls. Over the next few years, comprehensive programmes will be implemented to eliminate all forms of violence against women and girls, such as sexual and gender-based violence and harmful practices; trafficking and economic exploitation; femicide; and domestic and family violence. Extoling the benefits of women’s economic empowerment, both for economies as well as societies as a whole, United Nations Secretary-General António Guterres today encouraged governments, the private sector, multilateral institutions and others to take measures to achieve the full and equal participation of women in the economy.